When you say the word Jeep, a Wrangler is what most people will think of. With its military origins, it’s an instantly recognisable car that sums up the world of 4x4s perfectly. It was first available in 1987 but the car was sold officially in the UK from 1993 as a 2.5-litre, four-cylinder petrol with manual gears and 4.0-litre, six-cylinder petrols which are mainly autos but there are 5-speed manuals. A new and improved version was launched in 2007 with a 2.8-litre diesel in manual and automatic forms and a 3.8 petrol as an auto only. It’s big, bulky and often considered as an off-road beast. Trim levels on the earlier cars were Sport and Sahara, the latter having a removable hard top. A special edition Renegade in 2005 had 15-inch alloy wheels and a seven-speaker sound system. All have removable doors and fold down windscreen. 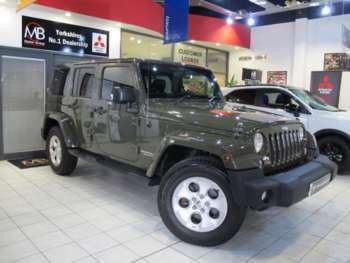 From 2007, Jeep Wrangler models retain Sport and Sahara trim for the diesels and Rubicon for the one petrol version. There's also a long wheelbase Unlimited version available. These newer cars have the Freedom Top which features removable roof panels over the front seats that can be stored in the vehicle and a rear section that can be unbolted and left at home, you can still take off the doors and fold the screen when you're on manoeuvres. On the road it's noisy with lots of tyre roar and a hard, bouncy ride. Handling isn't great, and the steering is vague. However, with its front and rear axles and high ground clearance, a used Wrangler can go places that ought to be impossible on four wheels. It may not be your first choice when it comes to practical everyday transport, but it’s perfect for tackling off-road terrains that other cars would struggle with.